Often has serendipity favored me, and tonight was a prime example. My lovely significant other and myself were driving Oklahoma Route 66 on a scouting mission for Ace Jackalope last night; while driving through Miami, we were attracted like moths to a neon sign we'd never seen lit. 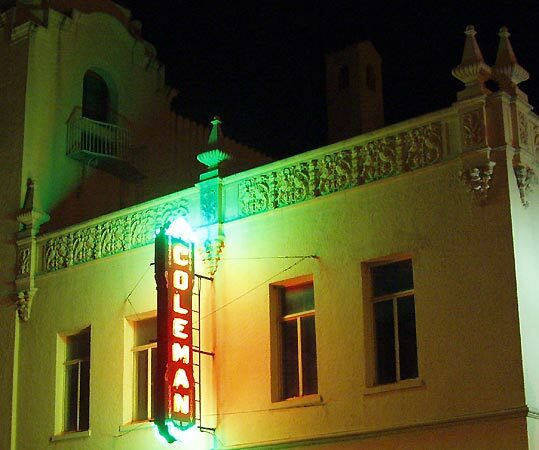 The sign is on the South side of the Coleman Theatre, a 77 year-old masterpiece of theater architecture on Route 66 in Miami. The Coleman Theatre (yes, they favor the British spelling...neat, huh?) is one of those places I'd always meant to get to, but it has slipped off the schedule thus far. Tonight, because I was driving through at precisely the right time, it leapt to the top of the list. I was photographing the sign from a zillion angles, using nearby sidewalk benches and planters as camera braces, when I noticed two ladies in front of the Coleman, also admiring the sign. Buoyed by the warm aura of strangers temporarily basking in the glow of something cool, I enthusiastically yelled across the street: "Do either of you have anything to do with this?" One of the women did; she is Barbara Smith, manager of the theater, and she told me the restored sign had only been lit since this past Friday, May 19. Without knowing us at all, she offered a tour...did I mention it was 9:49PM on a Sunday night? Now *that's* PR the way it ought to be done. Actually, I think she ushered us in out of genuine pride and affection for the Coleman. She and assistant manager Willie Smith proceeded to take us on a whirlwind one-hour tour of the restored theater, mixing in enough anecdotes to make me really wish I had an audio recorder (hey, they have ghost stories!). I'll show you some pictures, and tell you what I remember. 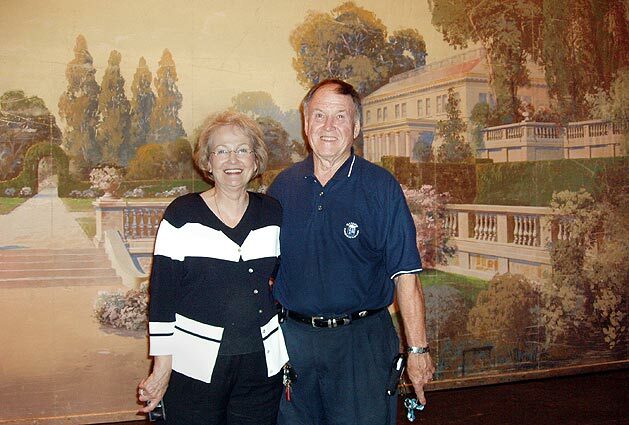 Here are Barbara and Willie in front of the stage backdrop. But, back to that sign: Here it is on the front (east) side of the Coleman in the year it was built, 1929. I didn't ask when it was moved to the side, but I do know it had not been illuminated in some time prior to last Friday. Two of these signs used to be on the marquis. I understand there is discussion of utilizing them again in a higher, more visible location. I noticed in looking at old file photos of the Coleman that it has gone through several slight rearrangements of its exterior elements over the decades. Incidentally, it was never out of business ("dark" in theater lingo) at any time since its opening. The place was built by George L. Coleman (1912-1997), Miami mining magnate and somewhat of an interesting person. 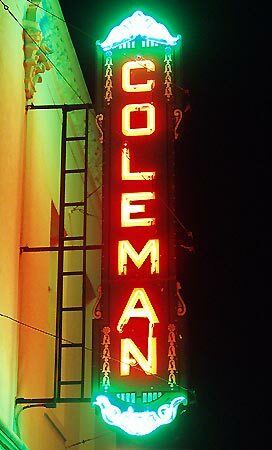 The Coleman family donated the theatre to the city of Miami in 1989. ...not that I could actually explain Louis XV's favored look in detail...let's just say "French" and "opulent". This is the view from the staircase leading to the balcony. There is a tradition associated with the statue. Apparently, ushers used to rub her derriere for good luck. 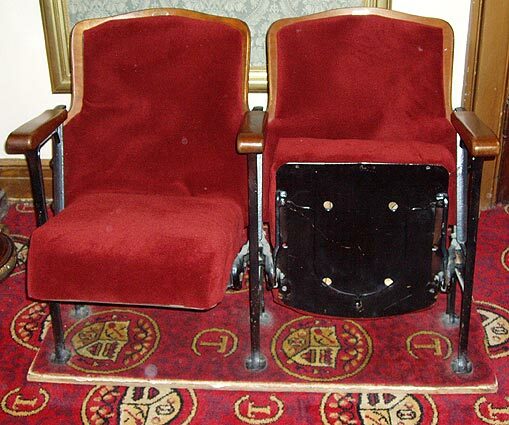 That's Coleman's family crest on the carpet, which, incidentally is new and patterned off old pieces such as the one beneath this set of original 1929 theatre seats. It's difficult to see, but there is a metal crescent underneath the seat; look at the bottom of the underside of the seat on the right. The metal piece was there to hold a man's bowler hat while he was enjoying the show. The lobby also has the neat art deco scale. 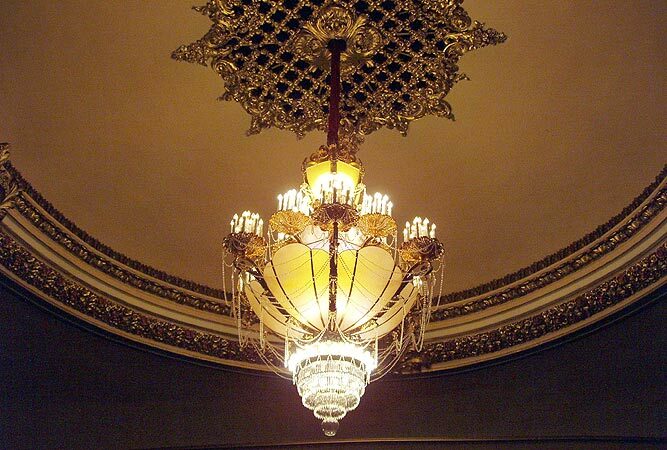 The theatre itself is elegant. 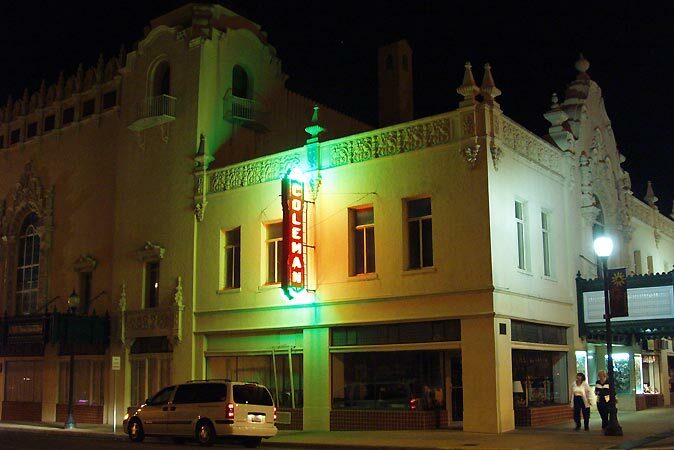 I've seen some great restored theaters in my time, not the least of which is the art deco Fox Theater in Hutchinson KS, and every time I walk into one, I want to see about a zillion old movies, starting with my favorite silents (German expressionism, mostly) and leading up through the Universal horror series and Casablanca. The original seating capacity of the Coleman was 1,600. It's a lot less now; aside from the fact that the balcony seats are not finished, the replacement seats on the main floor are wider then the originals. We've gotten bigger, you know. The as-built orchestra pit is now covered in order to provide more room for the stage. 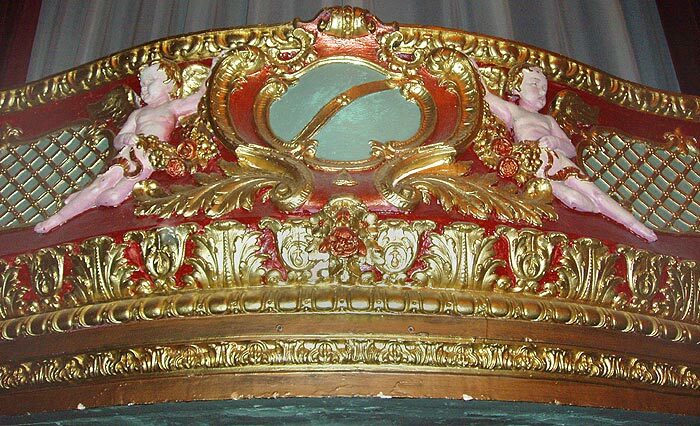 Like other theaters of its age, the Coleman was built not just for movies but for vaudeville as well. 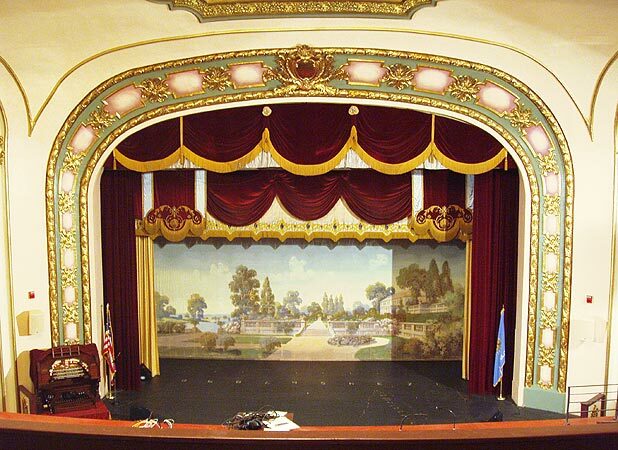 It is now used for movies, ballet, opera, musical performances, special events, etc. At first, I thought these were box seats. Former Coleman Theatre manager Jerold Graham informs me they were more interesting than that. 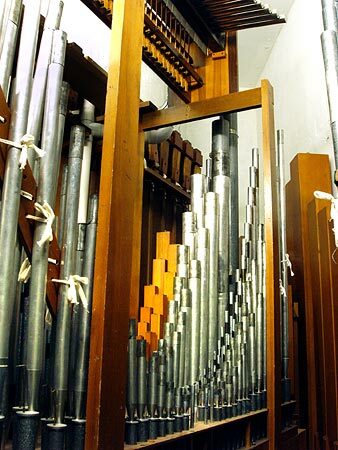 They are "faus-box seats" or "false-box seats" and this particular one covers an area where some of the organ pipes are situated. And here is a close-up of the decoration. 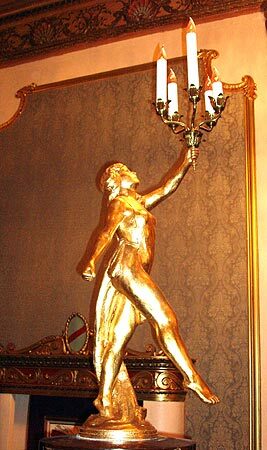 The chandelier is one of many items that were restored according to original specifications. 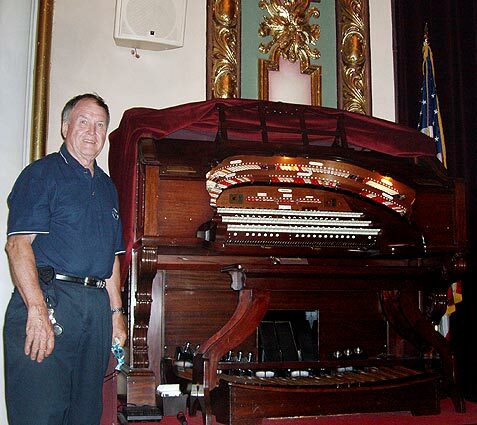 Another is the "Mighty Wurlitzer" pipe organ, which had actually left the theatre and was returned. While we were there, Willie had the organ play "Phantom of the Opera." It was the Andrew Lloyd Webber version, not the spooky one associated with Lon Chaney, but it was impressive, anyway. Here are just some of the pipes of the Wurlitzer; we saw them on our tour backstage; you can see part of a xylophone above. The backstage area was most interesting of all. There were fire doors everywhere; apparently Coleman was big on fire protection...and, ya know, the place is still standing. I liked the hardware. High above was a wooden platform (I'm sure there is a proper name for it) I can just see the caped murderer scurrying away after cutting the rope to the chandelier. Did I mention my mind starts to wander in places like this? Update: there is, indeed, a proper name. This is the "grid." 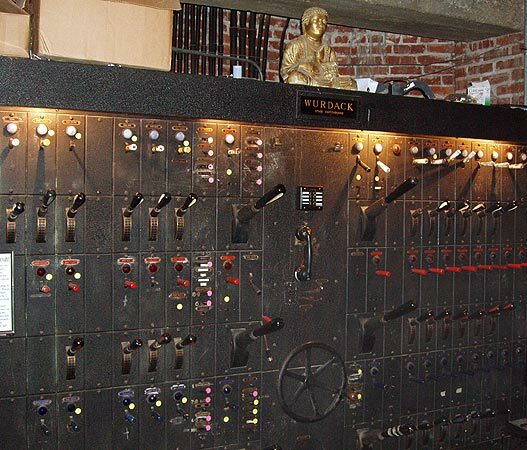 This very old Wurdack stage switchboard is original to the theatre. It reminds me of a mad scientist's control panel. I asked about the Buddha atop the controls. Apparently, he is there for good luck. 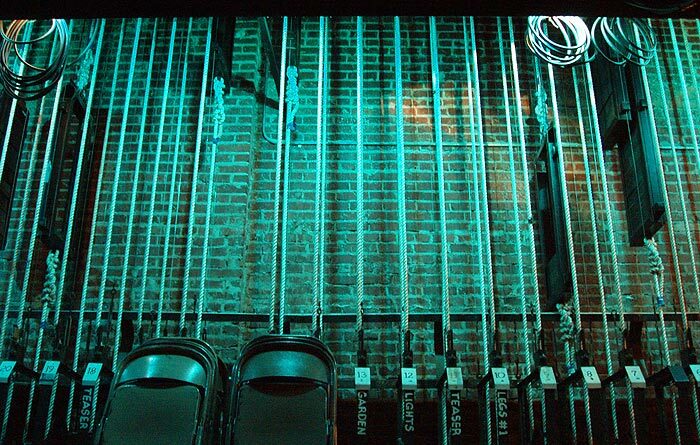 The blue light illuminating these cables comes from the theatre's "spirit light"...another superstition. Apparently you're supposed to keep at least one light on so that the spirit of theater never leaves. 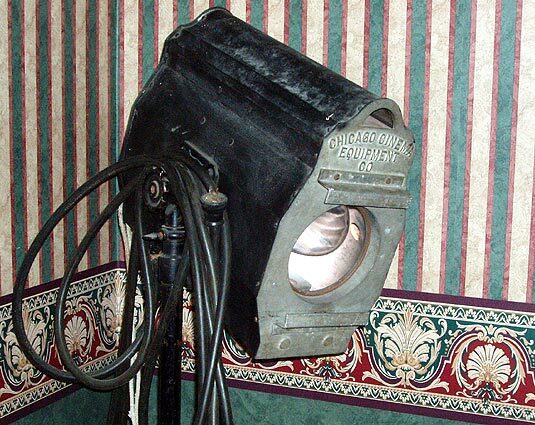 A vintage stage light, original to the theatre, is displayed in a waiting room backstage. 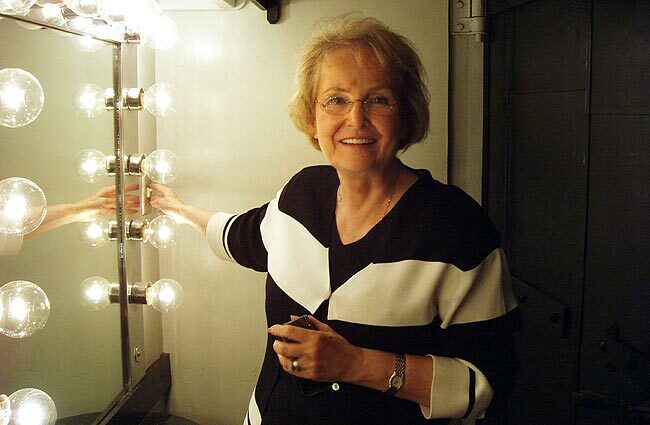 Barbara shows us the dressing room used by stars of old, and current entertainers. 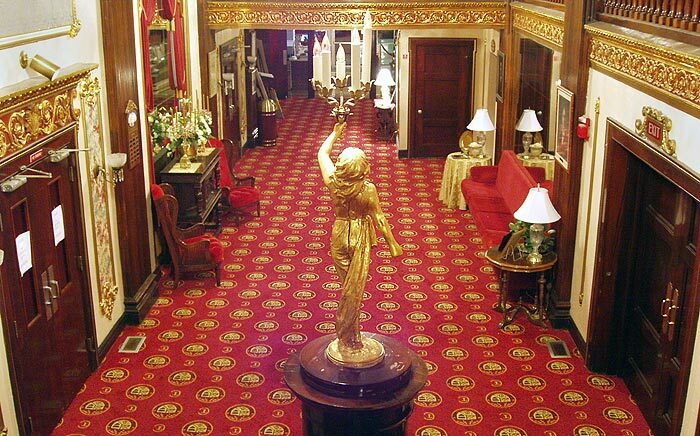 Back in the day, this room was used by entertainers like Sally Rand, Tom Mix and Blackstone the magician when they stopped at the Coleman. 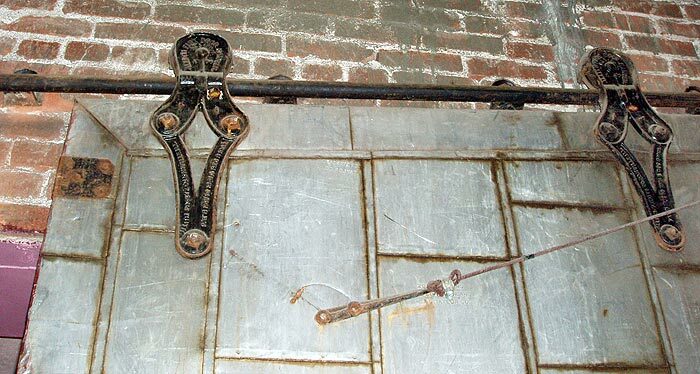 Restoring a theater takes ingenuity. Jerold Graham made these molds of original decor pieces so that duplicates and replacements could be cast. 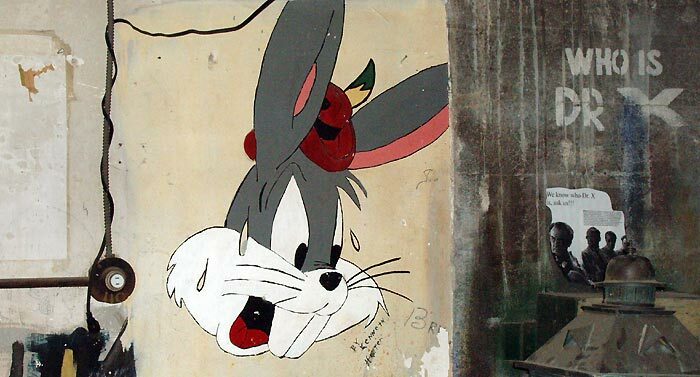 This decades-old Bugs Bunny drawing decorates a shop wall. Goodnight, ladies and gentlemen! Thank you for joining us, and don't forget your hats in those neat crescent-things under your seats. To see what's coming up at the Coleman Theatre, check out their website. What a great tour and thanks for sharing. Sometimes God just gives you one. Daughter and thespian says that the wood thingy that you could 'almost see the caped murderer scurrying away on after cutting the rope to the chandelier' is called a cat walk. Yeah! Absolutely thanks for sharing! What a beautiful theatre!! I live just outside of Miami now and have lived in this area my entire life. We saw old Pink Panther movies at the Coleman as kids, I saw Bambi and Annie there and have also attended operas, plays and shows there. I love the Coleman and am glad it's an important part of our community. The volunteers that work there are so accomodating, aren't they? Mr. Erwin (you didn't mention him so I guess he wasn't there that night) has taken us on private tours after the "Mystery Tours" were over, showing us parts of the theatre that few have seen. He took my Girl Scout troop through and introduced them to the theatre in a way I couldn't have. You can tell when someone truly loves a place and those volunteers do. It's nice to see pictures and hear about the theatre from someone else's point of view. I think sometimes we take it for granted. Thank you for this post. Oh and you must make it through in the fall and take a Mystery Tour! Chills galore! 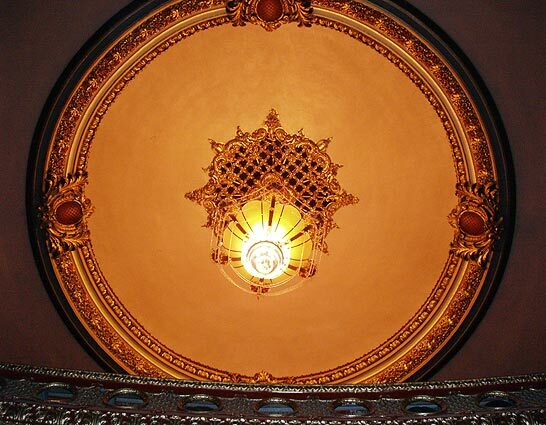 Great pictures of a truly great theater. I worked in the concession stand when I was a teenager and held hands in the balcony with my boyfriend. Such memories! Thanks for the pictures. I haven't been to the Coleman lately and I'm thrilled to see the latest improvements. I still dream about the Coleman and I recently found my original ticket to Star Wars from the Coleman in an old photo book.... price...$1.50 for adult! I always thought it was the most elegant and mysterious place in the world when I was growing up.Thanks! I grew up in Miami in the '50s, and spent many a summer weekend afternoon at the Coleman, where it was cool (literally), as few homes had a/c. On the SE corner of the theatre was a drugstore with an old fashioned soda fountain. 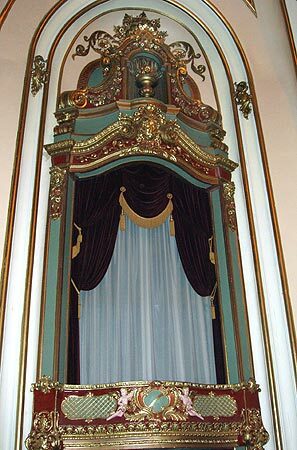 When a Martin & Lewis, or other popular movie, was playing, you could hardly find an empty seat in the theatre. Back then, we called it a "picture show." 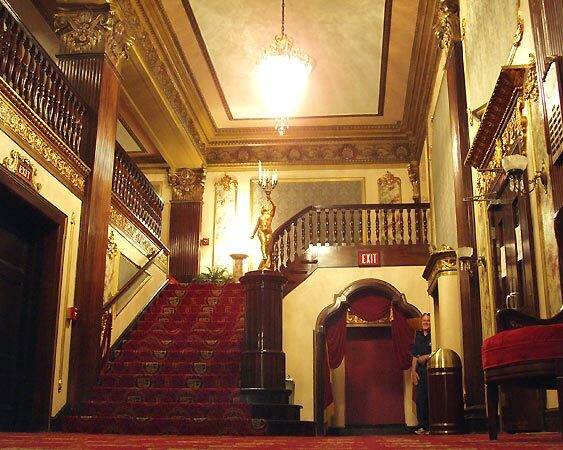 On Halloween, the Coleman hosted the city's kids for a horror film, and sometimes a stage show. The Coleman was a good place to hold hands with someone special. Ages ago, in the 50's, my grandfather was custodian at the Coleman Theatre (and, for a while, also at the Miami Theater). Many, many nights were spent here, watching movies then helping grandpa clean up afterard. As a result, there probably isn't any part of the theatre that I haven't been in (or on), including all the outside 'balconies' and on the roof as well. Later on, in the 60's, I worked there as a ticket taker/usher for a summer or two. I've never seen the place look so beautiful. In there inner foyer, past the concession stand, there were huge mirrors hung across from each other, over couches. You could see forever looking into the reflections between the two. Thanks for the beautiful pictures and tour. Not only was this a great theatre and a place to meet friends and hold hands with special people...but where has anyone seen such a movie theatre?? It also hosted the B.F. Goodrich Christmas Party every year for the employees children. That was always a fun day! Good movies, great entertainment and great gifts to the children. We were very fortunate to have such a beautiful establishment in the 50'5 and 60's. Thank You George Coleman for this beautiful Coleman Theatre! I am so thrilled that the Coleman still lives. 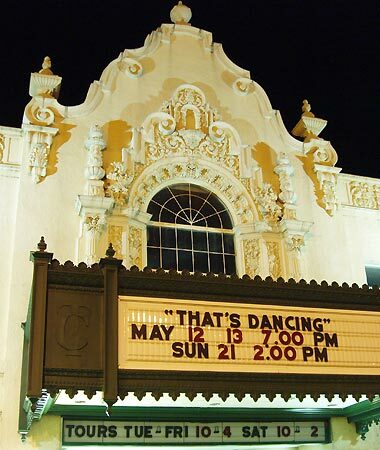 I know that theater holds a lot of memories for those of us who grew up in Miami. 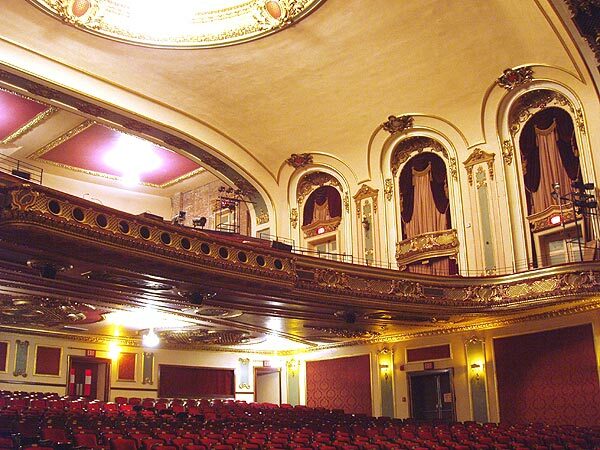 My father proposed to my mother in that theater in 1945. I was one of those B.F. Goodrich kids who attended those annual Christmas parties. I look forward to coming back for a tour and a movie. Thank you so much for those who believed enough in preserving a wonderful part of history. 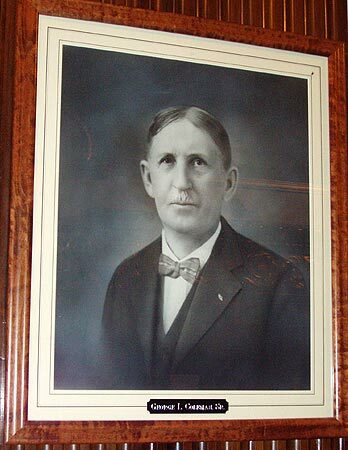 My grandfather Warren Cundiff ran the Coleman Theater for many years. My mother has the most amazing picutres of him and my grandmother (in their younger years) on the staircase and they look absolutely stunning! Someday I hope to go and have pictures of my loved ones and I on the stairs as well. 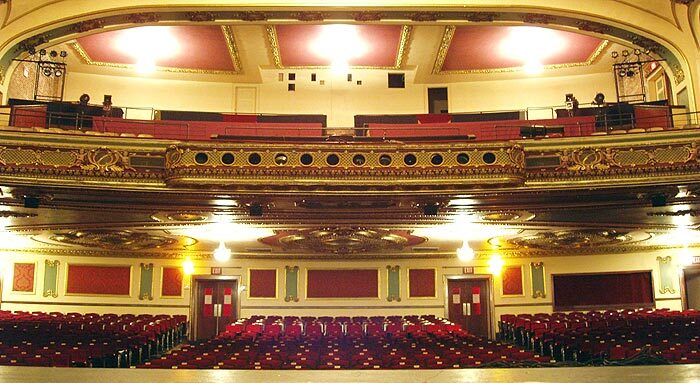 I've worked in the Coleman in one capacity or another since 1977 including manager from 1984 until the end of 1989 and I've been entrusted with researching the history of ALL the theatres of Ottawa County by the Friends of the Coleman president. I'm looking for anything and everything, pictures, dates, history, anecdotes, former employees. I noticed that several of the comments have been posted by those who might be able to help. These are beautiful pictures, I especially appreciate the inclusion of Bugs and the immortal question of "Who Is Dr.X". The theatre has always been a part of my life, quite literally for the last 30. I have been truly blessed to have been able to be a part of something so wonderful. Thank you for this most excellent post. Serita, if you happen to know who painted the Bugs Bunny, please tell us. Any other cool anecdotes of the Coleman would be appreciated, also. Rich, If I'm back there again I'll take some tech notes and post them. My best memory of the Coleman Theatre was attending Wednesday night ticket drawings - it always drew a large family crowd hoping their number would be called. Second best would be "smooching in the balcony" beyond prying eyes in the early 50's. Most Miami grads remember it! 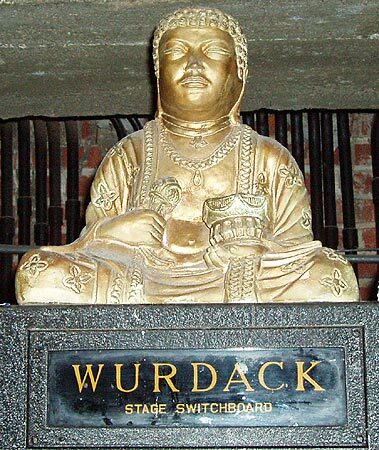 I stumbled on this great theatre tour while googling for "wurdack switchboard". (BTW: there are only two websites listed at Google. I came from that other one ;) Thank you for those fine pictures of that great theatre. One can feel that you loved what you saw.. I am 75 years old and spent my childhood in the Coleman Theatre. I always knew it was a beautiful place, but these pictures brought back the awesome memories from there. So beautiful!! Thanks for the pictures. I have sent them to everyone I know. i spent all my childhood christmases in miami. i vaguely remember the coleman. but this is a reason to return. i haven't seen miami in 20 yrs. It was great to be reminded of The Coleman Beautiful and to be brought up to date and to see the great photos of Coach Willie & Barbara Smith (The lady that gave me my start in radio, so to speak) My trips back to Miami have become fewer as the years go by but I promise that we will stop by to see thr Smiths and the Colman soon! I love this place. But you don't want to go to the film booth and be listening, smelling, and feeling the prescence of a ghost. I actually believe he is there. My mother was in the first graduating class that graduated in the Coleman with Geo. Coleman, Jr. I donated her senior class picture. Hope it is hanging somewhere to be seen by all. 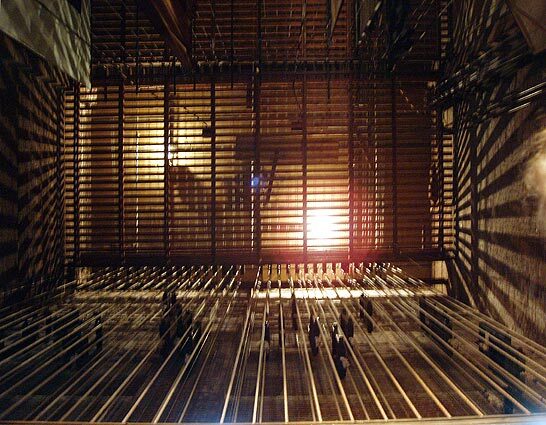 I really like the greenish photo of the fly rigging in that theater. I would love to use it in a solo cd i have coming up. Please email me and let me know if I can get a high resolution version and your permission to use it! When driving Route 66 in late December 2010, I stopped outside the Coleman and took some photos. Wow, what I missed by not having time to go inside (plus, my companions were not avid theatre buffs like me). And I missed noticing the spelling of theatre the (correct) way that we do here in England! A truely beautiful gem, love unique architecture. Lived here all my life and went to the theatre many times. I loved it so much I painted it in more as it looked years ago. Check out my painting on "you know your from Miami when" on Facebook. I love that place..We would go to the movies on Sundays back when I was a kid in the 80s..Glad to see it still together..